venues, First Class Functions can create your dream wedding. Certain months of the year can book out very fast so it is best to secure our services as soon as you have decided on choosing us. To secure the date we require you to fill out a booking confirmation form and pay a non- refundable deposit of $300.00 which is taken off the total bill. The final balance is due 14 days prior to your event. WHAT HAPPENS AT A STYLING CONSULTATION? Designing your Special day to suit your personal style and theme is extremely important to us. Face to face are recommended for at least one of the consultations so that you can see our showroom. Please allow an hour during which time we will cover off all the elements of your wedding from the ceremony thorough to the reception. We will discuss flowers, dresses, music, chair covers, place settings – whatever you need to make your day beautiful and stress free. While we try hard to accommodate your diary, weekend appointments can be especially difficult as we are often setting up other couples’ weddings. HOW MUCH IS A STYLING CONSULTATION? We offer your first and second consultation for free. Discussions can be via email, telephone or face to face. Additional consultations can incur a fee of $50. A starting price for delivery, set up and pack down for your wedding is $300.00. This minimum is based on a ceremony on Noosa Main Beach with a reception locally around Noosa. The exact amount will be calculated once we have met with you and confirmed your items and the amount of staff required etc. WHAT HAPPENS IF I CHANGE MY MIND ON THE STYLING? We understand that circumstances change, dresses change, colours change (just to name a few!) throughout the wedding planning process. We pride ourselves on being extremely understanding to these circumstances and would be happy to work through changes with you. DO YOU PROVIDE WEDDING COORDINATION ON THE DAY? CAN I INCLUDE SOME PERSONAL ITEMS IN MY WEDDING? We understand that you may have things that you like to incorporate into your wedding (signs, favours, photographs and other little bits to make your day extra special.) If you have booked us for decorating, we would be happy to help put some of your items out for you. However any set-up that takes more than one hour will incur an additional charge at our hourly rate. CAN I DROP PERSONAL ITEMS INTO YOUR SHOWROOM? Yes you can! While we will accept any items the week prior to your wedding, and take as much care as possible, we cannot be held responsible for any loss or damage. When items are dropped in, you will just need to complete a form to confirm what you are leaving and instructions on where they are to go. Congratulations – it is considered to be a great omen for a long and happy marriage! We always plan a back up option to ensure the ceremony goes ahead with as little disruption as possible. We will confirm a mutual plan the morning of your wedding. Please also be aware that certain ceremony items cannot be used outside in wet or damp weather (such as aisle carpets, some lighting, peacock chairs etc) so these will not be available in adverse weather conditions, regardless of booking and paying for these items. HOW DO I GET MY BOUQUET ON MY WEDDING DAY? 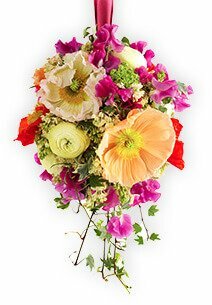 Not only are stunning flowers included in our exceptional floristry service but we also deliver them to you personally within a 10km radius of Noosa. We will also deliver button holes etc to a second Noosa address if these have also been ordered through us. All our flowers come in floristry boxes, surrounded by tissue to keep them in perfect condition until you are ready for them. One less thing for you to worry about! WHAT IF SOMETHING BREAKS OR GOES MISSING? As you can imagine things can go missing or are broken at weddings especially receptions, so unfortunately we do need to charge any loss or breakages to the you after the wedding – we require credit card details as a security deposit – this is compulsory. For weddings there is no set minimum spend, however we do have a minimum requirement that at least 2 services are booked with us. This can include ceremony, reception decorating, floristry services or catering. WHAT IS THE BOOKING & ADMIN FEE FOR? A non-refundable booking and administration fee of $75.00 applies to all bookings. This small fee covers our office staff to setup your file to include all your relevant information, send receipts for deposits, prepare proposals and site inspections etc. ARE THERE ANY PUBLIC HOLIDAY SURCHARGES? We set up weddings & events 364 days a year – that’s right, every day except for Christmas Day. To cover staff costs and other fees on public holidays, we charge a 20% surcharge to your final invoice cost. DO YOUR QUOTES INCLUDE GST?